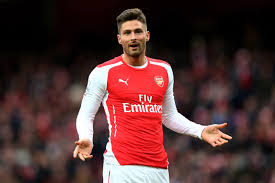 Arsenal manager, Arsene Wenger expects Olivier Giroud to 'boom' into form and recapture his goalscoring run for Arsenal in the Premier League title chase. "Look, it is a weight on the shoulders when the players don't score,” Wenger told the club's official website. “So the fact that they score will of course take that weight off. "Overall, I am pleased that Giroud and Walcott scored. But it is a bit cyclic always, especially for Giroud. He [Giroud] has cycles so it was a weight off his shoulders. "You know this season for example, he has had games where he has gone boom, boom, boom, boom, boom and after he had a little spell where he didn't score. Now I hope he has a repetition of his former spell and starts to score again"
"We will see if he plays tomorrow"